Microsoft has announced Surface Go, a cheaper, smaller model to sit at the budge end of its Surface range of tablets and laptops. The new model starts at $399, will be available for pre-order today in selected territories, and ships on August 2nd. In the UK, the Surface Go is £379 inc VAT for 4GB RAM and 64GB storage, or £509.99 inc VAT for 8GB RAM and 128GB storage. I go back a long way with Surface, having been at the launch of the first device, Surface RT, back in 2012. The device was a flop, but I liked it. The design was genuinely innovative and sought to make sense of a Windows in transition from desktop-only to a viable touch/tablet device. It failed primarily because of the poor range of available apps, lack of user acceptance for Windows 8, and somewhat underpowered hardware. There were also keyboard issues: the fabric-based Touch keyboard was difficult to use because it gave no tactile feedback, and the Type keyboard less elegant and still somewhat awkward. Surface Pro came next, and while it was more useful thanks to full Windows 8 and an Intel Core i5 CPU, it was disappointing, with battery life issues and a tendency to stay on in your bag, overheating and wasting battery. There were other niggling issues. The big disappointment of Surface for me is that even with full, Apple-like control over hardware and software, the devices have not been trouble-free. Another issue today is that Windows 10 is not designed for touch in the same way as Windows 8. Therefore you rarely see Windows tablets used as tablets; they are almost always used as laptops, even if they are 2-in-1 devices. The original kickstand design is therefore rather pointless. If I got another Surface it would be a Surface Laptop or Surface Book. Of course they are not all bad. It is premium hardware and some of the devices are delightful to use and perform well. They are expensive though, and I suggest careful comparison with what you can get for the same money from partners like HP, Lenovo and others. This means your $399 will soon be $550 or more. It could still be a good deal if it turns out to be a nice device. The Hello camera is a plus point, but where I would particularly recommend a Surface is if you want Pen support. Microsoft is good at this. Unfortunately I do not get on well with pen input, but some people do, and for artists and designers it is a real advantage. Asus has announced Project Precog at Computex in Taiwan. This is a dual-screen laptop with a 360° hinge and no keyboard. The name suggests a focus on AI, but how much AI is actually baked into this device? Not that much. 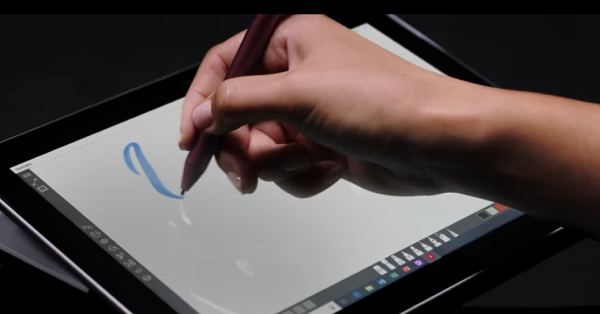 It features “Intelligent Touch” that will change the virtual interface automatically and adjust the keyboard location or switch to stylus mode. It includes Cortana and Amazon Alexa for voice control. And the press release remarks optimistically that “The dual-screen design of Project Precog lets users keep their main tasks in full view while virtual assistants process other tasks on the second screen,” whatever that means – not much is my guess, since is the CPU that processes tasks, not the screen. Even so, kudos to Asus for innovation. The company has a long history of bold product launches; some fail, some, like the inexpensive 2007 Eee PC which ran Linux, have been significant. The Eee PC was both a lot of fun and helped to raise awareness of alternatives to Windows. The notable feature of Project Precog of course is not so much the AI, but the fact that it has two screens and no keyboard. Instead, if you want to type, you get an on-screen keyboard. The trade-off is extra screen space at the cost of convenient typing. I am not sure about this one. I like dual screens, and like many people much prefer using two screens for desktop work. That said, I am also a keyboard addict. After many experiments with on-screen keyboards on iPads, Windows and Android tablets, I am convinced that the lack of tactile feedback and give on a virtual keyboard makes them more tiring to work on and therefore less productive. Still, not everyone works in the same way as I do; and until we get to try a Project Precog device (no date announced), we will not know how well it works or how useful the second screen turns out to be. Microsoft’s Surface range is now extensive. 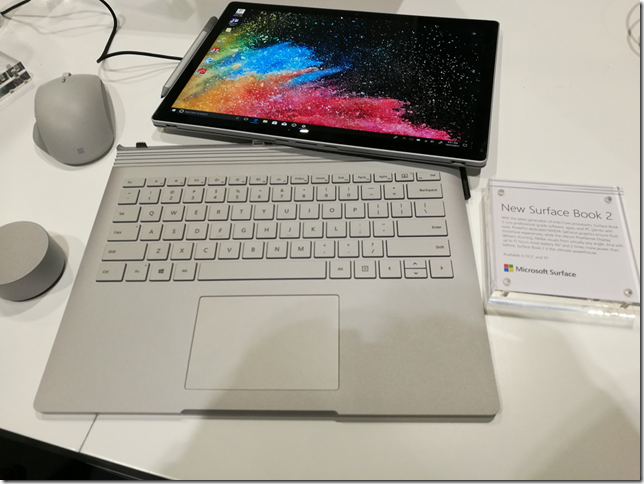 There is the Surface Pro (tablet with keyboard cover), the Surface Laptop (laptop with thin keyboard), and the Surface Book (detachable tablet). And the Surface Studio, an all-in-one desktop. Just announced, and on display here at Microsoft’s Future Decoded event in London, is Surface Book 2. The device feels very solid and the one I saw has an impressive spec: an 8th Gen Intel Core i7 with 16GB RAM and NVIDIA GeForce GTX 1050 discrete GPU. And up to 17 hours battery life. All good stuff; but I have a couple of reservations. One is the weight; “from 3.38 lbs (1.534 Kg) ”, according to the spec. By contrast, the Surface Laptop starts at 1.69 lbs (0.767 Kg). That makes the Book 2 heavy in today’s terms. I am used to ultrabook-style laptops now. Of course you can lighten your load by just using the tablet. Will you though? I rarely see Windows convertible or detachable devices used other than like laptops, with the keyboard attached. The Surface is more likely to be used like a tablet, since you can simply fold the keyboard cover back, but with the Book you either leave the keyboard at home, and put up with short battery life, or have it at least in your bag. Sweetlabs Android App Services: what is it? Margins on smartphones are thin, which is why we regularly hear commentary about how only Apple and Samsung are making any money from them. Vendors therefore look for other ways to monetize their business, though it is never easy, and there are plenty of examples of failed music stores and other premium services. Google can always make money, through Play Store revenue, ads served via Search, and monetizing the data it collects. But what of the smartphone vendors? One obvious strategy is to pre-install applications, for which the app developer may pay. I say may because without inside knowledge its impossible to tell whether the Facebook app, for example, is pre-installed as a benefit to customers or because Facebook has paid something. Most users would probably install the Facebook app anyway; but fewer would install the Opera web browser, to take another example, so common sense says that if you find Opera pre-installed, it is more likely than Facebook to have paid for the privilege. On Windows PCs, which also suffer from low margins, the pressure on manufacturers to make money from pre-installed applications has had a dire affect, significantly reducing the appeal of the product. At worst, you can pay good money for a PC, turn it on for the first time, and be greeted by a flurry of dialogs inviting you to install this or subscribe to that, along with warnings that your new purchase is “not protected”. Apple has never allowed this of course, which is one of the attractions of Macs. Another consequence was that Microsoft introduced its own brand of PC, Surface, and opened stores selling “signature” editions of PCs on which most of the foistware is absent. The situation on Android should never be as bad. The operating system has a modern design, which means that applications are isolated and cannot cause as much damage as on Windows. If an application that you do not want is installed, it is easy to remove. Sweetlabs is a company which specialises in monetizing app installs on Windows as well as Android. On Windows it is best known for the Pokki app store. Sweetlabs does not always present its brand overtly to users. Users are not its customers after all; its customers are app developers and smartphone vendors. Is this a good or bad thing? The answer is nuanced. I dislike the way the notification implies that these optional app install are part of device setup; it is not, it is a marketing app. You can get all these apps through the official Play Store and App Services is consuming unnecessary system resources. On the other hand, if you accept that pre-installing apps is inevitable given the low margins in this business, the Sweetlabs approach has advantages. Instead of simply dumping a bunch of unwanted apps on your device, you can choose which ones you want, if any. Therefore the company promotes itself as a better approach, even presenting itself as a fix for crapware. My review device had pre-installed apps on it as well, though, so it is more a case of putting up with both. From the perspective of app developers, any service that helps get your app noticed in a beyond-crowded market is a significant benefit. Sweetlabs also offers an app analytics service focused on who is installing your app. I wrote this post because I did not find much information about App Services when I searched for it after seeing the notification on my review device. If you are wondering whether you need it on your device, the answer is no; it does nothing essential, it is a vehicle for promoting apps, and you can safely disable or remove it. I recommend installing apps from the Play Store instead, where you can see user reviews and other information. It is not really evil though; it may have reduced the price of your smartphone as well as providing app developers another way to get their products noticed. Popular free music player foobar2000 is coming to mobile platforms, following a successful community fundraising campaign. Curiously this is not a Kickstarter campaign even though it looks similar. The project is the outcome of collaboration between Steve Elkins (known as “Spoon”) who is the creator of dBpoweramp, an excellent audio converter and CD ripper for Windows, and foobar2000’s originator Peter Pawlowski. The mobile version of foobar2000 will run on iOS 6 or later, on iPhone, iPod and iPad; Android v4 or later on phones and tablets; and Windows Phone 8 and Windows 8.1 tablets, ARM and Intel. There will be both free and “fully featured premium” versions. Additional projects for cloud synchronization and backup, and for social interaction built into foobar2000, have not yet received enough funding to proceed, and look unlikely to do so. Foobar2000 is loved for its speed and efficiency, easy extensibility with plug-ins, and advanced functionality. Its user interface is functional rather than beautiful, though it is also easily customised. I use foobar2000 with a large collection, mostly Flac files ripped from CD, and foobar2000 manages the database transparently and with instant results. Exactly what features mobile foobar2000 will have is not clear. The best source of public information I can find is this thread which includes input from Spoon. There may or may not be ads in the free versions; the cost of the premium versions is unannounced. Asus unveiled its Winter 2014 UK range at an event in London yesterday. It is an extensive range covering most bases, including Android tablets, Windows 8 hybrids, Google Chromebooks, and Android smartphones. Asus never fails to impress with its innovative ideas – like the Padfone, a phone which docks into a tablet – though not all the ideas win over the public, and we did not hear about any new Padfones yesterday. The company’s other strength though is to crank out well-made products at a competitive price, and this aspect remains prominent. There was nothing cutting-edge on show last night, but plenty of designs that score favourably in terms of what you get for the money. Two FonePad 7″ Android phablets: tablets with phone functionality, LTE in the ME372CL at £129.99 and 3G in the ME175CG at £199.99. Three Zenfone 3G Android phones, 4″ at £99.99, 5″ at £149.99 and 6″ at £249.99. Transformer Book T200 and T300 joining the T100 (10.1″ display) as Windows 8 hybrids with tear-off keyboards. The T200 has an 11.6″ display and the T300 a 13.3″ display and processors from Core i3 to Core i7 – no longer just a budget range. The T200 starts at £349. Transformer Book Flip Windows 8.1 laptops with fold-back touch screens so you can use them as fat tablets. 13.3″ or 15.6″ screens, various prices according to configuration starting with a Core 13 at £449. G750 gaming laptops from £999.99 to £1799.99 with Core i7 processors and NVIDIA GeForce GTX 800M GPUs. G550JK Gaming Notebook with Core i7 and GTX 850M GPU from £899.99. Unfortunately the press event was held in a darkened room useless for photography or close inspection of the devices. A few points to note though. The T100 is, according to Asus, the world’s bestselling Windows hybrid. This does not surprise me since with 11 hr battery life and full Windows 8 with Office pre-installed it ticks a lot of boxes. I prefer the tear-off keyboard concept to complex flip designs that never make satisfactory tablets. The T100 now seems to be the base model in a full range of Windows hybrids. On the phone side, it is odd that Asus did not announce any operator deals and seems to be focused on the sim-free market. How good are the Zenfones? This is not a review, but I had a quick play with the models on display. They are not high-end devices, but nor do they feel cheap. IPS+ (in-plane switching) displays give a wide viewing angle. Gorilla Glass 3 protects the screen; the promo video talks about a 30m drop test which I do not believe for a moment*. The touch screens are meant to be responsive when wearing gloves. The camera has a five-element lens with F/2.0 aperture, a low-light mode, and “time rewind” which records images before you tap. A “Smart remove” feature removes moving objects from your picture. You also get “Zen UI” on top of Android; I generally prefer stock Android but the vendors want to differentiate and it seems not to get in the way too much. Just another phone then; but looks good value. As it happens, I saw another Asus display as I arrived in London, at St Pancras station. The stand, devoted mainly to the T100, was far from bustling. This might be related to the profile of Windows these days; or it might reflect the fact that the Asus brand, for all the company’s efforts, is associated more with good honest value than something you stop to look at on the way to work. For more details see the Asus site or have a look in the likes of John Lewis or Currys/ PC World. Beautifully packaged and presented (strong inner box with outer sleeve) this gaming headset has a real premium feel to it, further enhanced by a high-quality drawstring bag which includes an outer pocket to store the heap of supplied cables and adaptors. What is a “gaming headset”? Essentially, simply including a microphone is enough for some, though you might expect a gaming headset to be tilted towards a more exciting presentation with deep bass and sharp treble. Personally I favour a neutral presentation since getting an exciting sound is the job of those producing and mastering the audio for the game, not the headset, though an extended frequency response is needed. Fortunately the HyperX Cloud gets this mostly right, which is why it is decent for music as well as games. “You are now on the way to the ultimate gaming experience,” proclaims the letter on the inner box (though that is all the documentation I could find, save what is printed on the outside of the box itself – you can download a manual from the HyperX site if you want). But is the claim justified? Despite the futuristic brand name, this is a traditional over-ear closed-back headset with analogue-only connections. This means you have a jack plug for the headphones and a second jack plug for the microphone. There is also an adapter that combines them to form the four-way jack used by smartphones, tablets, and PlayStation 4. A further cable lets you add an in-line control box with passive volume control, call/answer button and microphone mute. The closed back design means good noise isolation and less disturbance for others in the same room. Analogue connections are essential for smartphone use, but on a PC it means you are reliant on the quality of the audio out and mic in on the soundcard. The microphone input is often a weak point. You can avoid this by using a USB headset, so don’t get this unless you are confident of the quality of your soundcard. Further, with an analogue headset there are no whizzy virtual effects, no great loss in my opinion. A pair of spare earpads, with a fabric finish in place of the smooth finish on the pre-fitted earpads. Both are comfortable. The main cable is braided, as is the control box extension, but the other cables are not braided, which is odd. If you use all the cables you end up with a 4m cable. If you want to use the control box, you end up with a 2m cable. Too long is better than too short, but you might find it getting in the way. It is a tiny detail, but I would have liked colour coding on the floating jack sockets, to match the colour coding on the plugs. The sockets are marked if you look closely but it is easy to connect them wrong. Another slight nit is that the socket for the detachable microphone has a small cover that I will probably lose. I would prefer this to be a hinged flap. The control box is OK but not up to the standard of the rest of the kit. The microphone mute button is stiff and awkward, and the volume control feels cheap. Both worked fine though. The good news is that sound quality is exceptional. There is a real three-dimensionality to the sound, which together with extended frequency response (15Hz to 25,000 Hz is claimed) makes for a great experience. Compared to the very best (and generally more expensive) headphones the HyperX is slightly coarse, and the tone is slightly weighted towards the bass, but I find the headset fine for music (especially pop/rock; they are less suitable for classical) as well as gaming, and for the money this is one of the best I have heard. The headset is comfortable enough that I can happily wear them for a long session, whether gaming or music. The microphone is also reasonable quality, with a high enough output for my PC soundcard to get decent volume though with some hiss. It is good enough for uses like Skype, dictation software and so on as well as gaming. Overall I recommend this headset, if you are looking for an analogue rather than a USB connection. It is well made, well presented, and ticks the two most important boxes: comfort and sound quality. More details on the HyperX site here. Soundgarden’s Superunknown in DTS virtual 11.1 surround-sound: better than stereo for your mobile listening? A&M/Universal has released Soundgarden’s classic 1994 Superunknown album in the DTS Headphone:X format, which offers 11.1 virtual surround sound through normal stereo headphones. Is such a thing possible? I am sceptical of the claims for 11.1 (11 discrete channels plus sub-woofer) though the DTS Headphone X demo app is most impressive, and you hear the surround effect clearly. When I first heard this demonstrated at Mobile World Congress in Barcelona, it was so convincing that I took off my headphones to make sure that the sound was not really coming from speakers positioned around the studio. This demo is included in a new app developed for the 20th anniversary of Superunknown. The app is free. and also includes a free sample track in virtual 11.1, Spoonman. Surround sound mixes by Adam Kasper at Studio X, Seattle and Bob DeMaa at DTS, Calabasas, California. The app offers four settings for listening: In Ear, On Ear, Over Ear, and unprocessed stereo. DTS knows what it is doing: with On Ear headphones, the On Ear setting sounded best and the In Ear setting muffled; with earbuds, the In Ear setting sounded best and the On Ear setting harsh. But how is the sound? The odd thing about the Headphone X system is that the spectacular demo raises expectations that actual music does not deliver; the surround illusion is less striking. That said, there is a huge difference in sound between plain stereo and virtual surround. Unfortunately switching to virtual surround significantly raises the volume, making comparison more difficult, but the surround processing does open out the sound and make it more immersive. It is easier to pick out individual instruments. Bass is more accentuated. It is not all in one direction though; the stereo sounds cleaner and less processed. Still, I would personally choose to hear the DTS version. It is effective technology even though I cannot honestly say that it sounds like 11.1 surround sound. Producer Kasper is quoted though saying: “The experience Soundgarden’s fans will hear over headphones is identical to how I heard the mix in the studio when producing the surround sound version.” This could be a matter of which headphones you use, or he might be exaggerating. I am less impressed with the app itself. Tracks are slow to load and I got occasional stuttering on an older iPad. The settings menu pops up repeatedly, rather than remembering your last setting. If you switch from the tracklist to the Player menu and back you get a momentary pause in the sound. The design is basic and it looks as if the app was put together quickly. It is also obvious that having a separate app for every album is hopeless as a long-term strategy. Space is also an issue. The app with the album downloaded is 344MB and there is no provision for storing the music files anywhere other than in the iPad’s on-board storage. It is unfortunate that once downloaded, the surround mix is only available on that device; you cannot download for both iOS and Android with one voucher. Overall I still like it, and would like to see more surround mixes released in this format. It may not be quite as good as the real thing, but it is vastly more convenient. You can get the new app here, on Apple iOS or Android, and try it for yourself. 1. The PC OEM hardware ecosystem was (and to a large extent still is) stuck in a vicious loop of a price-sensitive market driving down prices and forcing vendors to skimp on design and materials, and to pre-install unwanted third-party applications that damage user experience. Most high-end users bought Macs instead. With Surface Microsoft breaks out of the loop with premium design and zero unwanted add-ons. 2. The tablet market. Windows 8 is designed for touch, at least in its “Metro” personality. But desktop apps need a keyboard and mouse. How do you combine the two without creating a twisty monster? Surface with its fold-back, tear-off keyboard cover is an elegant solution. 3. Fixing Windows. Users of today’s PCs live on a precipice. One false click and the adware and malware invades. Live in the “Metro” environment, or use an iPad, and that is unlikely to happen. Use Windows RT (Windows on ARM) and it is even less likely, since most malware cannot install. Surface could not have happened without Windows 8. The efforts to make it work as a tablet would make no sense. Now we have Surface 3. How is Microsoft doing? I have followed Surface closely since its launch in September 2012. The models I know best are the original Surface RT, the second Surface RT called Surface 2, and the original Surface Pro, which is my machine of choice when travelling. A few observations. There is plenty that I like (otherwise I would not use it so much). It really is slim and compact, and I would hate to go back to carrying a laptop everywhere. It is well-made and fairly robust, though the hinge on the keyboard covers is a weak point where the fabric can come unglued. The kickstand is handy, and one of my favourite configurations is Surface on its kickstand plus Bluetooth keyboard and mouse, with which I can be almost as productive as with a desktop (I do miss dual displays). I can also use the Surface successfully on my lap. In cramped aircraft seats it is not great but better than a laptop. There are also annoyances. Only one USB port is a severe limitation and seems unnecessary, since there is room along the edge. For example, you plug in an external drive, now you cannot attach your camera. Not being able to upgrade the internal SSD is annoying, though I suppose inherent to the sealed design. Performance was poor on the original Surface RT, though Surface 2 is fine. More annoying are the bugs. Sometimes the keyboard cover stops working; detaching and re-attaching usually but not always fixes it. Sometimes the wifi plays up and you have to disable and re-enable the wifi adapter in device manager. Another problem is power management, especially on Surface Pro (I gather that Pro 2 is better). You press power and it does not resume; or worse, you put it into your bag after pressing power off (which sends it to sleep), only to find later that it is heating your bag and wasting precious battery. The key point here is this: Microsoft intended to make an appliance-like PC that, because of the synergy between first-party hardware and software, would be easy to maintain. It did not succeed, and even Surface RT is more troublesome to maintain than an iPad or Android tablet. Microsoft also ran into user acceptance problems with Windows RT. Personally I like RT, I think I understand what Microsoft is (or was) trying to achieve, and with Surface specifically, I love the long battery life and easier (though this imperfect) maintenance that it offers. However, the apps are lacking, and Microsoft has so far failed to establish Windows as a tablet operating system like iOS and Android. People buy Windows to run Windows apps, they make little use of the Metro side, and for the most part Surface customers are those who would otherwise have bought laptops. Incidentally, I have seen Surface RT used with success as a fool-proof portable machine for running Office and feel it deserved to do better, but the reality is that Microsoft has not persuaded the general public of its merits. Another issue with Surface is the price. Given most Surface customers want the keyboard cover, which is integral to the concept, the cost is more than most laptops. But was Microsoft going for the premium market, or trying to compete with mass-market tablets? In reality, Surface is too expensive for the mass-market which is why its best success has been amongst high-end Windows users. That brings me to Surface Pro 3. The intriguing aspect of yesterday’s launch is that it was rumoured to be for a new mini-sized Surface probably running Windows RT. Why else was the invite (which someone posted on Twitter) for a “small gathering”? Admittedly, it is a stretch to suppose that the Surface Mini was cancelled between the date the invitations were sent out (around four weeks ago I believe) and the date of the event. On the other hand, this is a time of change at Microsoft. The Nokia acquisition completed on 25th April, putting former Nokia CEO Stephen Elop in charge of devices. Microsoft CEO Satya Nadella has only been in place since February 4. While cancelling a major hardware launch at such short notice would be surprising, it is not quite impossible, and a report from Bloomberg to that effect seems plausible. It is also well-known that Microsoft does not intend to continue with three mobile operating systems: Windows x86, Windows on ARM, and Windows Phone. Windows Phone and Windows RT will “merge”, though merge may just mean that one will be scrapped, and that it will not be Windows Phone. The promised arrival of a touch-friendly Microsoft Office for Windows Phone and Windows 8 further will rob Windows RT of a key distinctive feature. This does not mean that Microsoft will not complete in the growing market for small tablets. It means, rather, that a future small tablet from Microsoft will run the Windows Phone OS – which is what some of us thought Microsoft should have done in the first place. This is a company that sometimes takes the hardest (and most expensive) possible route to its destination – see also Xbox One. Surface Pro 3 is a large-size Surface Pro. 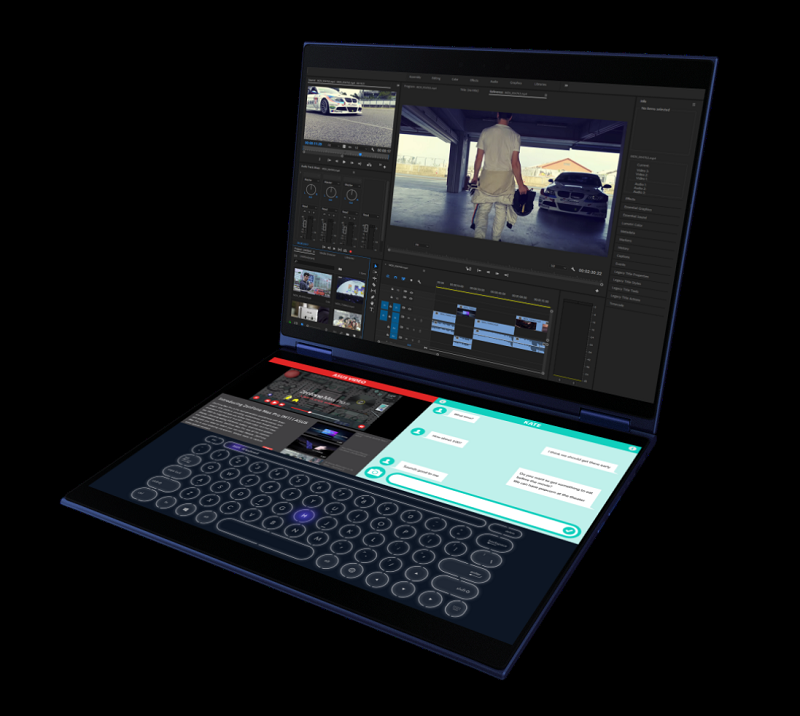 It has a 12 inch 2160×1440 screen, a pen, and a redesigned keyboard cover that has an additional magnetic strip which sticks to the tablet when used laptop-style, for greater stability. The kickstand can now be used at any angle, supposedly without slipping. The weight is 800g making it lighter than a MacBook Air. though note that the MacBook Air has a keyboard built in. Battery life is quoted as “up to 9 hours”. There is still only one USB port. Full specs are here. The Surface Pro 3 looks like a nice device. In the UK it starts at £639 for an Intel i3 device with a tiny 64GB SSD (I am running out of space with 128GB). And don’t forget the cover which will be at least £110 on top (prices include VAT). A sensible Core i5 with 256GB SSD and a Type 2 cover will be around £1200. Not a bad buy; though personally I am not sure about the larger size. Note that Microsoft has now abandoned the 16:9 wide-screen format which characterised the original release of Windows 8, designed to work well with two apps side by side. Surface Pro 3 has a conventional 3:2 screen ration. Microsoft’s Surface project had a bold vision to reinvent Windows hardware and to usher in a new, more secure era of Windows computing, where tablet apps worked in harmony with the classic desktop. It was bold but it failed. A combination of flawed implementation, patchy distribution, high prices, and above all, lack of success in the Windows Store ecosystem, meant that Surface remained at ground level. What we have now is, by all accounts, an attractive high-end Windows hybrid. Not a bad thing in itself, but far short of what was originally hoped. Microsoft is moving on, building on its investment in Active Directory, Azure cloud, and Microsoft Office, to base its business on an any-device strategy. The market has forced its hand, but it is embracing this new world and (to my mind) looks like making a success of it. It does not depend on the success of Surface, so whether or not the company ends up with a flourishing PC business is now almost incidental.